by Kelsey Wiens on July 18, 2014 · 0 Comments. 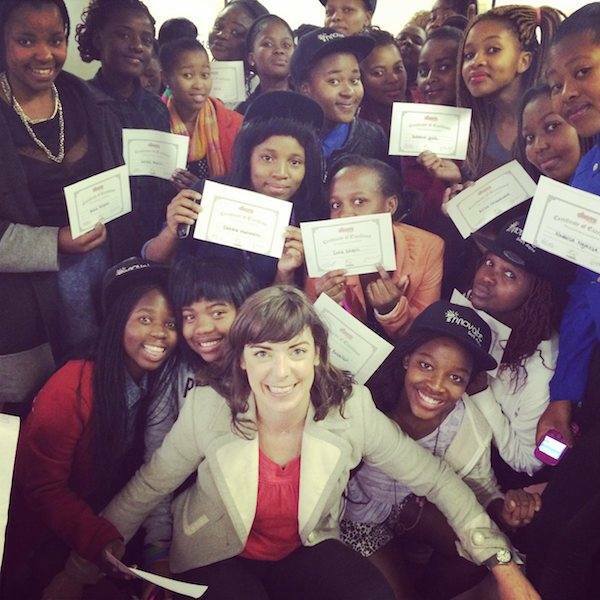 #Code4CT is a three-week training program from Innovate South Africa with twenty-four grade 10 and 11 girls from Centre for Science and Technology (COSAT) in Khayelitsha (Cape Town, South Africa). The three-week course consists of sessions on how the web works and actively participating in building web content. Running over the girls winter school break, they learn about the design process, HTML and CSS programming languages — skills they use to build WordPress sites for their clients. The girls then take their new skills and create mobile sites for local community organizations to benefit their communities. We were lucky enough to be invited with Obami (learning platform) to test out our CC4Kids program. The program was funded through a Creative Commons Affiliate Project Grant. We have run the course through a self-study platform but this was the first time running it in real life. We were inspired by how quickly the girls took to the course content. The course’s modules focus on basics of Copyright and CC licenses — by the end of the hour the girls were creating their own CC licensed material! It was an inspiring day, a highlight of the day was the girls remixing the Pharrell Williams dance steps from “Happy” as a remix exercise Hack the Happy Dance. We are also attending their ‘pitch’ sessions today to see what mobile apps they designed. Thanks to Code4CT and Mozilla for the opportunity to be part of Maker Party! And stay tuned for more Maker Parties to be hosted by us and other CC/School of Open volunteers as part of the School of Open Africa Launch in August and September. School of Open is excited to be partnering with Mozilla to celebrate teaching and learning the web with Maker Party. Through thousands of community-run events around the world, Maker Party unites educators, organizations and enthusiastic Internet users of all ages and skill levels. School of Open shares Mozilla’s belief that the web is a global public resource that’s integral to modern life: it shapes how we learn, how we connect and how we communicate. But many of us don’t understand its basic mechanics or what it means to be a citizen of the web. That’s why we’re supporting this global effort to teach web literacy through hands-on learning and making with Maker Party.